Trx Squats can be a great exercise for beginners or people recovering from knee injuries because you can "deload" your knee joints with the trx. Many trx exercises are so much harder than their machine or dumbbell counterparts, but the squat is an exception to that rule. Squats in general are a great overall leg exercise because they are a functional movement that works all of the lower body muscles at the same time. However, for many people squats may place increased pressure on the knees. 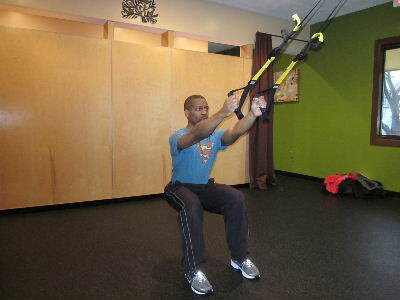 With the trx you can practice the squatting motion while "deloading" the knees. Deloading is just a fancy term that means that you can decrease the load that your bodyweight places on your knee. You can deload the knee in 2 ways: #1 you can use your upper body to support your weight, and #2 you can lean backwards to shift the load from the quads, knee, and patella to the glutes, hamstrings, and hips. 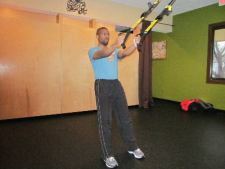 Starting Position: Begin by grasping the trx handles with your palms facing each other. Move away from the trx so that there is no slack in the straps. Keep your feet about hip width apart, and engage your core muscles to maintain good posture in your spine. Form: Inhale and slowly squat down towards the floor, while keeping the pressure between your heels and the balls of your feet. Hold for a brief second at the bottom, and then exhale as you return to the starting position. Personal Trainer Tips: In order to deload the squat, you have to make sure there is no slack in the trx straps. You can do this with your arms bent or with your arms straight. As you get stronger, try to use your arms less and less. If you really want some serious strength in your legs you need more than just your body weight as the resistance, so the barbell squat or dumbbell squat would be a great progression from the trx. If you don't have access to weights, so can progress to the lunges with the trx or 1 legged squats with the trx. The trx is a great tool, and squats with the trx could be a good option for people who are returning to strength training following a knee injury. The benefit is that you can deload your knee joint to take off some pressure. If you don't have access to a trx, you can try ball squats as a way to lean backwards and take some pressure off the knees when squatting.